This is the fifth of a series of seven articles on professional service innovation. The objective of the series is to provide a basic introduction to innovation management for managers, partners and change agents working in professional service firms. 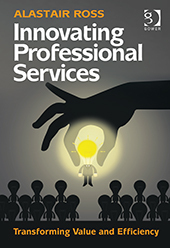 This article looks at how to enhance client value using innovation. To read the first article in the series go here. In the previous article I discussed the opportunity for cost reduction in a firm’s internal processes or services. In this article I’m focusing on the opportunity to improve value to clients through enhanced or new services. In what ways can we improve value to clients? 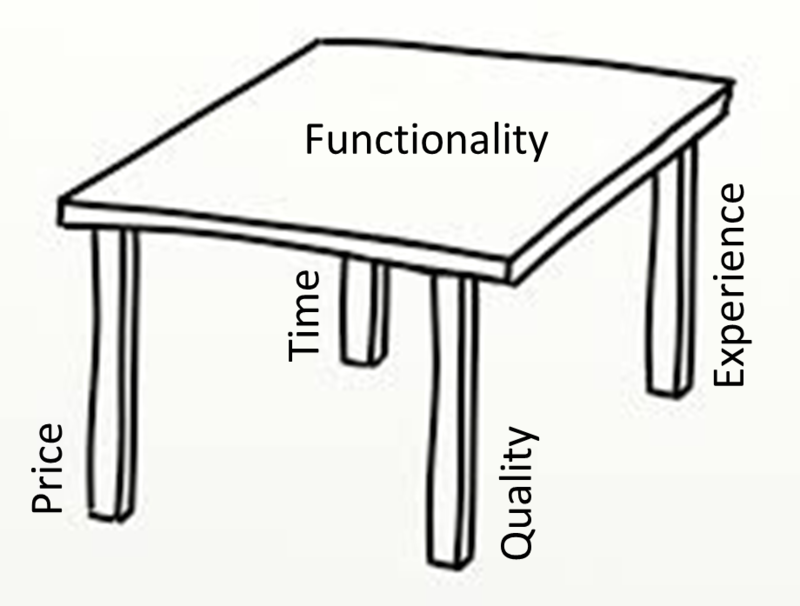 We can think of value of a table, as shown in Figure 1. Functionality is the surface, as this is what clients/customers wish to buy in the first place – they are buying a service or a product to meet some specific requirements they have. The functionality of the service offered has to at least meet their minimum requirements to be considered. 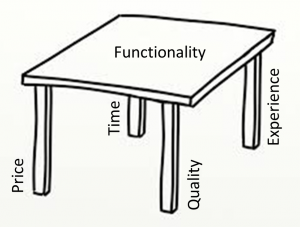 The four legs of the table represent the four attributes of how that functionality is delivered: The price of the service; the time it takes to deliver the service or respond to customer requests; the quality of the service provided (whether corrective actions are needed to address errors or omissions); finally the user experience in the lifecycle of acquiring and using the service. 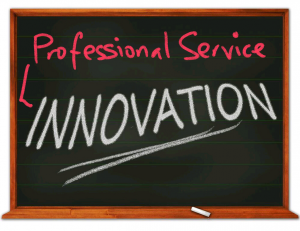 Innovation in any of these five areas will increase value to clients. This is effectively customization – it reduces the time and cost required by the client to tailor the service deliverables to their needs. This could be as simple as the structuring and format of reports to address different audiences, or to enable them to use reports or information directly with their own customers or suppliers. Much customization is achieved by adding additional cost and time, a better way is to achieve this is by what is called mass customization – using a modular service offering that can be configured to a customer’s requirements, with little additional time or cost. This can be achieved by enhancing the existing functionality (for example by adding additional analysis or reporting) or by broadening the scope of the service offered. Cost reduction in services (as discussed in the previous article) can enable firms to either increase their margins or improve their competitiveness through keener pricing of their services. Fixed fee service offerings allows firms to make this choice, hourly fee arrangements automatically give clients the benefits of efficiency improvements. Another way to enable price reduction is by removing some existing work elements that clients do not value or by getting clients to perform some of the lower added-value work themselves (an IKEA approach if you like). Thus it is key to understand the elements of value contained within your service and how clients perceive their relative importance. Clients are increasingly seeking budget certainty and thus defined price arrangements from firms – for example fixed fees or yearly fees – are increasingly relevant. ‘Performance-based’ pricing is always interesting to discuss, but more difficult to implement (often requiring complex metrics) and will only really succeed if there is the basis of an open and trusting relationship between client and supplier. This ensures that clients do not waste time and cost correcting or accommodating errors resulting from the supplied service. Quality means the performance against defined performance metrics (in services these are typically captured in Service Level Agreements (SLAs). It’s key that quality measures reflect what is truly important to clients, as there is a cost to measure, meet and report on these measures. Ongoing process management and innovation is key to good quality – and this is an area many professional service firms are weak in, so the cost of meeting quality targets can be high (i.e. measurement, rework, re-training and reporting). This provides clients with service deliverables faster and is important for time-sensitive work (e.g. Due Diligence work). Service mapping and Lean approaches can be used to identify opportunities for reducing the elapsed time on activities and reducing any inherent delays. The use of self-service approaches using internet portals can also be effective in enabling clients to work at their own speed (and also reduces the potential for wasted time by fee earners). This makes the service easier and less stressful for client users. Improvements in experience need to be focused on key service touch points with clients and addressing any issues at these touch points. The overall service goal should be to delight not simply satisfy clients – as merely satisfied clients are always at risk of defection to rivals. To enable ongoing successful value-based innovation, a firm needs to gain deep insight into its clients’ businesses, to understand how they work, what their customers want and their key challenges. Once the landscape of a client’s business is truly understood, then the firm is well placed to identify opportunities for innovation. Engaging clients in this journey in a collaborative approach is an effective way of identifying and testing new innovations and building a valued and trusted relationship in the process. In the next article I will show how firms can start or accelerate their innovation programme. Whilst the term ‘re-engineering’ is typically prefaced by the word ‘process’ as this is the key focus area, re-engineering in professional services firms is very much about people. Successful re-engineering requires partners, fee earners and support personnel to make changes in their beliefs, behaviours and working methods. No small challenge then! To help illustrate the people-side of re-engineering in professional service firms, I’m going to review two recent projects I performed for a medium-sized UK law firm operating across three offices over a 12 month period. Codexx was contracted to help the firm drive major improvements in the efficiency of service delivery. The sponsor for the programme was the Managing Partner. The programme commenced in summer 2013 with an ‘Opportunity Assessment’ where I worked with the firm to select the initial services for re-engineering. The selection criteria we used included the potential financial benefits achievable through re-engineering as well as the level of support and commitment from relevant partners. As this was the start of the programme, it was particularly important to pick two services with a good likelihood of success – as otherwise it would reduce internal support for subsequent projects. For the first wave, two services were selected: an insurance claims management service and a clinical negligence service. Both services were delivered in relatively high volume, at a fixed fee, to important clients. And neither service was profitable. A ‘partner champion’ for each service was selected and I worked with each of them to help prepare them for the re-engineering programme that we were to undertake. The methodology we used in this programme was the Codexx ‘Smarter Working’ re-engineering solution which we developed and have used with professional service firms over the last decade. 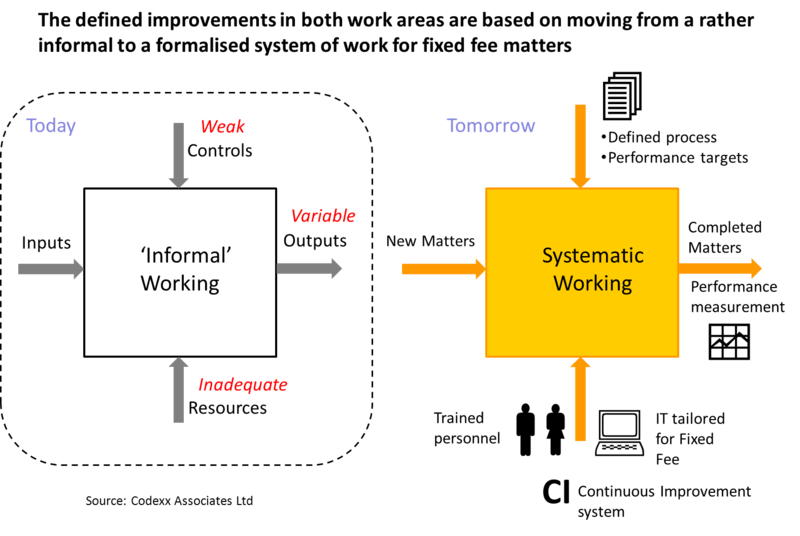 This uses a phased approach (see diagram) with a high level of collaboration from the client and the work in the initial AS-IS and TO-BE phases performed in interactive workshops and client visits. The importance of the partner champions in professional service re-engineering projects cannot be underestimated. They help set the importance of the project for the fee-earning team members who are continually challenged for time on the project with their chargeable work commitments. If the partner champion is less than committed, the team members will follow suit. In this programme both the partner champions proved to be both committed and effective – attending all the required workshops and leading the team in challenging existing ways of working and identifying opportunities for service improvements. Together we selected a core team for each of the services, comprising 3-4 lawyers and an administrator. I established the ‘Steering Committee’ comprising the Managing Partner, Finance & HR Directors and Department Heads, for progress reviews and key decision making (e.g. in project investments) during the programme. Then the workshops was scheduled and we kicked off the programme with the first ‘AS-IS’ workshop for each of the two services. 3. To get the core team to recognise and commit to the need for change. To do this our workshops cover both analysis and training in Lean-based service analysis and improvement principles. Thus the team members are able to map the existing service and identify key wastes. I guided the team in profiling the value provided to clients and the service experience they receive. I then prepared them to visit a number of selected clients to get their views on the service provided by the firm and to identify service improvement opportunities. In parallel I worked with the partner champion and Finance department to gather financial performance information on the service to identify typical matter cost and the resulting profit margin. So at the conclusion of the AS-IS phase we had a rich, detailed picture of the existing performance and issues of the two services and a growing list of potential improvements, which the partner champions and I reported to the Steering Committee. Equally important in this phase is the development of the team – both in the beliefs and capabilities of the individual members and the team’s effectiveness as a whole. Initially in these two projects there was more than a little doubt in the team members about the value of this programme. The most experienced and senior associate in the claims management team was frankly dubious that their working methods could be improved in any significant way. This is not an unusual reaction in our legal projects, as process-thinking is not common in law firms. Indeed a lot of the concepts and thinking that we introduce to the team – such as Lean thinking, waste identification, process mapping, service disaggregation and right-skilling – is new and indeed alien to most lawyers! 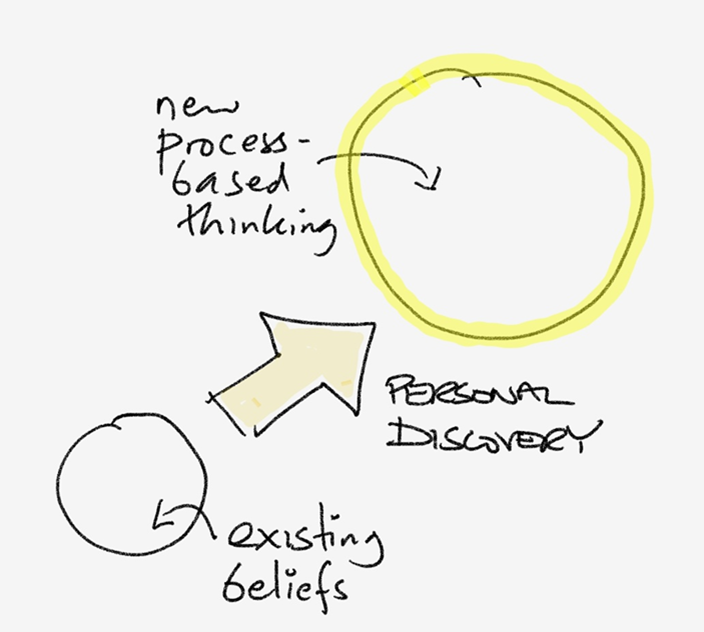 As our approach is deliberately collaborative with the team members actively performing mapping and analysis, they each make a journey of self-discovery by using these techniques and seeing the results for themselves. 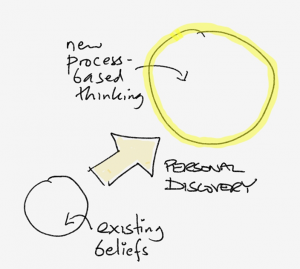 This results in an important transformation of individual thinking and leads to a level of buy-in to the resulting changes that is far deeper and permanent than a consultant-enforced change. Some of the major challenges in the AS-IS phase in this programme were: Difficulty in getting accurate service cost data and issues of fee earners fitting in project work alongside their existing client workload. 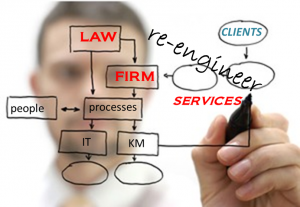 These are challenges typically experienced in most of our legal re-engineering projects. The objective of the TO-BE phase is to build on the learning from the AS-IS phase and design a new process, with a supporting organisation and IT, for delivering the service which is significantly more efficient (to yield cost savings) and provides higher value and a better experience for clients. In addition an implementation plan with supporting resourcing and business case are needed to validate the case for change. To help in ‘framing’ the team’s TO-BE work, we typically use a ‘Vision workshop’ at the start of this phase with a number of partners and managers. We share the team’s AS-IS findings and work to develop a 3-5 year Vision for the service, with measurable targets. In this programme I ran a vision workshop for only one of the two services, where the multi-office and multi-partner operation of the service meant that it was valuable to share progress and likely changes to get partner input and eventual buy-in to support the partner champion. In the TO-BE phase I worked with each team using a number of innovation tools and the existing ideas list to generate a number of ‘transformational concepts’ for the new service which we then mapped. This provided a blueprint for the new service which required much less time and cost to deliver whilst improving on the existing client service. The concepts were developed into transformation projects, making use of Codexx project definition templates, and an overall implementation plan and business case for change. Interestingly, whilst at the start of the programme both teams were adamant that a new case management system was needed to enable major efficiency improvements, they did not eventually recommend this in the TO-BE phase. For by then it was clear that whilst the existing Case Management software was indeed old and ‘clunky’ the implementation of new case plans and templates to support the new TO-BE process would enable major improvements. So for now the old case management system would be ‘good enough’ – which improved the business case for these changes. The major changes in the new TO-BE process for each service was an underlying process that was optimised to reduce required fee earner time, that was ‘right-skilled’ to push work down to the lowest skill level that it could be performed at with acceptable quality, that was ‘codified’ using templates and documented procedures that captured and deployed the ‘one best way’ approach for repetitive work elements, making use of Case Management to control workflow and deliver documents. Both services also changed the way in which experienced associates and partners were used in the service. Their time was reduced and focused on ‘up front’ matter strategy to guide fee earners rather than ‘back end’ review and checking of work already performed – to maximise their value and minimise fee earner inefficiencies. This freed up the most experienced (and expensive) fee earners to work on more complex work. Overall the TO-BE for both services moved them from a rather informal working approach, where issues in resources and controls had led to variable (and expensive) outputs, to a more systematic working approach with improved resources and controls leading to more consistent outputs, at lower cost (see diagram below). The objective of the Implementation phase is to realise the TO-BE service by executing the defined transformation projects. Both programmes required the development and documentation of new templates, a ‘new process bible’ and updating the case management processes and screens (though keeping the existing case management system). Implementation is always a challenge. The Managing Partner of one of our clients referred to it as ‘the grind of implementation’, which is an apt description. For the AS-IS and To-BE workshop phases of a re-engineering programme are ‘new and exciting’ with much collaboration. But in contrast, Implementation is more akin to ‘heads down’ and ‘get it done’ by project teams working on their own for much of the time – whilst team members also juggle a case load of work. It’s tough. We recognise this and particularly the challenge for time from client work. To help in this we provide a monthly progress review with the project leaders and partner champion, to keep at least a ‘monthly pulse’ of project work and to identify issues early. Despite this, we find that law firm projects typically slip and on this programme it was no different with most projects completing 8 weeks late. One key reason for this is that it is the core team members that typically lead the transformation projects and it is difficult to get their case load reduced during the implementation period (despite our recommendations) so they are typically very busy. Our two programmes differed somewhat in their implementation experience. The claims management service was delivered from one office and thus is was easier and thus faster to get the required buy-in and implement the required changes. The clinical negligence service was delivered from teams and partners located across three offices. The partner champion thus had the added challenge of streamlining a service using fee earners who did not directly report to him, necessitating working to get the buy-in of other partners. In addition this service was more complex and thus required more work on process detailing and case management changes. I have been placing more emphasis on this phase in our re-engineering projects with law firms. This is because there is always the danger that the new methods and resulting improvements can fade away, as these islands of ‘new ways of working’ are surrounded by a large ocean of ‘business as usual’ in the rest of the firm…. So locking in new ways of working is key to retaining their benefits. But this is really not enough. For the reality is that there will continue to be downward pressure from clients on fees. So unless the firm wishes to suffer eroding margins, it needs to find further improvements over time. So the objective of the Continuous Improvement phase is to lock in the existing improvements and establish a simple and ‘light touch’ system for identifying and implementing ongoing improvements that will further improve service and cost-effectiveness. Key elements that we put in place for these two services were a performance dashboard with monthly updates and at least a quarterly session involving team members to define improvement needs. One ongoing challenge is how best to reward fee earners delivering a fixed fee service and motivate them to further improve service efficiency – whilst their conventional targets and compensation are based on chargeable time… As part of these two programmes the firm recognised the need to develop new mechanisms for fee earner recognition based more on revenue and profit generated than on time recorded. Both services have now been operating with the new methods for around 9 months at the time of writing. Compared to their operation prior to re-engineering, the claims management service has reduced costs by around 70% whilst maintaining service quality and improving reporting and billing quality. In addition, the firm has strengthened its relationship with the financial services client receiving the service, as the firm’s lean-based improvements were seen very positively by the client. The clinical negligence service has reduced costs by around 50% whilst improving service consistency and providing a faster service to its public sector client. This significant cost reduction meant that both services are now providing a good level of profit to the firm. In addition, the fee earners in the teams working to the new methods have given a very positive feedback – a key reason being that they are finding the work less stressful than before – whilst delivering a better service at higher productivity. 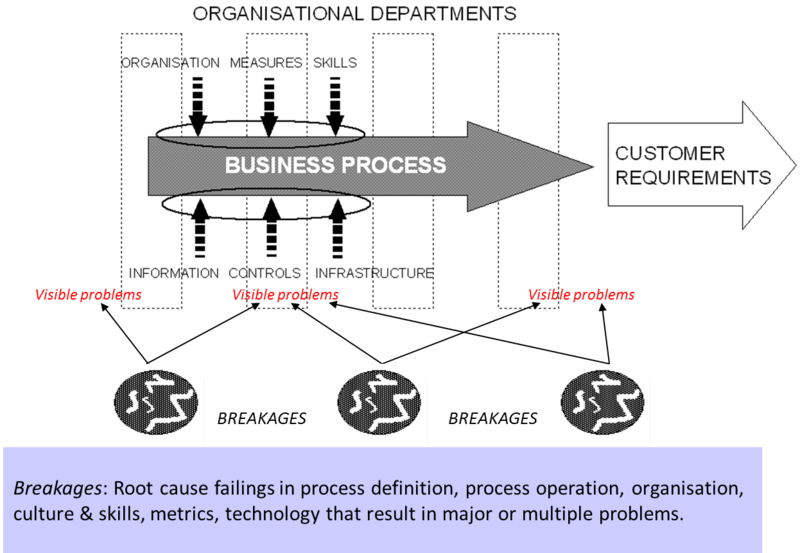 One team has used their process analysis experience to map and analyse a related support process which had performance issues. The firm subsequently commenced two more service re-engineering projects with Codexx. It is all too easy for internal support functions, such as IT, R&D or HR, within organizations to lose sight of their purpose and their customers over time, resulting in poor service and inefficiency. For such functions do not operate in an open market where customers are the final arbiter and can take their business elsewhere. The result can be costly and poor internal support, which adversely impacts the performance of the entire organisation. So how do organizations ensure that internal services are provided effectively and efficiently? Such a question was asked in the European operation of a global engineering company as part of a major transformation programme driven by the business challenges resulting from the 2008 economic crash. The function in focus was a production support function, responsible for the development, maintenance and enhancement of production lines and new production technologies for multiple factories in Europe and internationally. This function was key to the business as it provided important core competencies in new production technology platforms and automation. Codexx was asked to perform a review of the function as part of the transformation programme. The specific remit was to clarify current task responsibilities and interfaces, determine key problem areas and identify required improvements. This was a sizeable organization of more than 200 engineers and technicians, centred in northern Europe, but with teams also based in Eastern Europe and China. We took a customer focused, service-led approach to the review, rather than focusing on the existing organisational structure. We did this as we considered the delivery of these services as the fundamental mission of the function. If we had aligned our approach with the existing departmental structure, we would have limited our thinking. 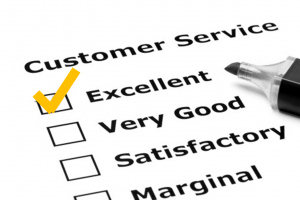 We defined four key services provided by the function and focused our review on how well these services were delivered. We then identified five key internal customers, such as the factories and the R&D function, and then interviewed them to get their views as to the key measures of success for the services provided to them. To review the effectiveness of the existing organisation and to point the way towards structural improvements, we asked each department within the function to determine the % of their workload spent on each of the key services and their key challenges in performing this work. We also asked each department to identify the % of their time spent working with each of the other functional departments and also their customers. This helped us identify any misalignment in the current organisational structure. We then assessed the quality of the service delivered and the efficiency of delivery for each of the four services using workshops with the key internal customers. In these workshops we identified the key service touch points or ‘moments of truth’ to determine how well the function was serving each customer. 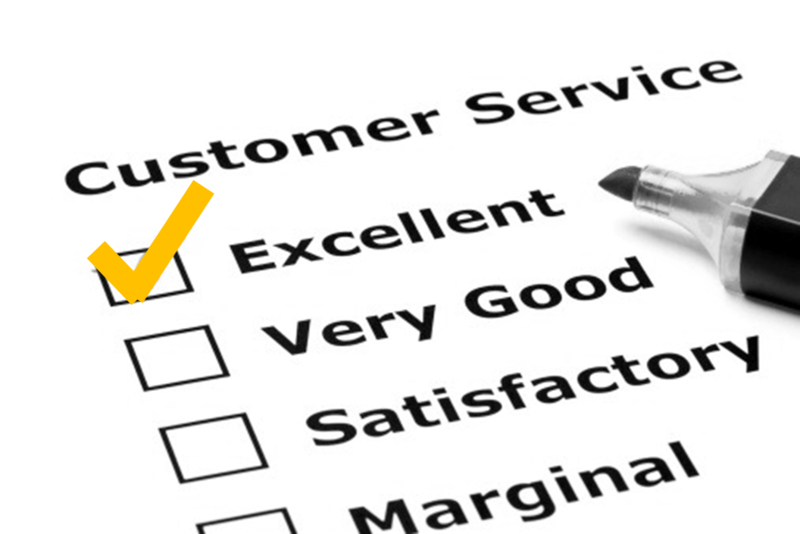 This provided a very clear ‘voice of the customer’ which was very specific in their requirements and issues. We then held workshops with the key functional departments to feed back these customer views on their service performance and to identify the root cause ‘breakages’ within the department’s operation or processes that was causing the identified issues. We reviewed each department’s effectiveness at working with other functional departments and identified opportunities for improvement. We also worked with each department to get their assessment on the effectiveness of the currently defined business processes, including how well they were documented and deployed. We found that whilst the organisation was progressive in its use of process management, with a defined set of business processes, there were weaknesses in how well these processes were actually ‘lived’ in daily business. Our approach was deliberately collaborative and we engaged 80 managers and employees in the review – covering both those in the function and those who were customers of the function’s services – so that we could be sure that we had a good feel for the function’s service requirements, its performance and key underlying challenges. This enabled us to identify key ‘breakages’ in the existing function, such as weaknesses in the function’s role in the critical NPI (New Product Introduction) process, weaknesses in the strategy and definition of production technology platforms and challenges in providing sufficiently responsive production support. In developing improvements we maintained our service-led customer focus. We were also guided by visioning work we performed with the function’s management team that identified increasing trends of globalisation of production, increased cost focus and speed to market – which the function had to meet if they were to maintain a viable future within the organisation (for outsourcing of internal services was increasingly an option to be considered). 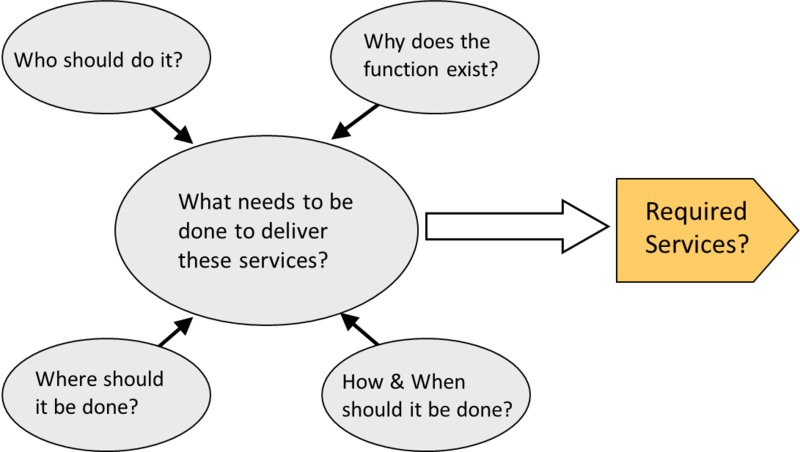 We asked fundamental questions (see first diagram) about how best the required services should be provided, to meet internal customer needs and to do so in a way that was affordable. Based on this and the findings from our stakeholder and internal assessment, we identified 7 key improvement projects. These covered improved internal processes – particularly in the definition of completion criteria at key stages – also improvements in the platform development approach and organisational changes to provide improved and ‘joined-up’ services to production customers. We then worked with the functional managers to define an implementation programme. Internal service functions should be able to demonstrate effective service delivered in an efficient manner. If this is not the case, they need to be re-engineered or outsourced. A customer-focused service-led approach can be effectively used to assess the performance of an internal support function and to define any improvements required. Due to the high engagement of internal customers in such an approach, it is much easier to get their support for any required changes. You are currently browsing the Codexx blog archives for November, 2015.